Making cauliflower soup always reminds me of my mother. She makes a classic cauliflower soup, thickened with flour and milk. Thick, hand-mashed, with some small cooked florets of cauliflower kept aside for serving, with cracked black pepper on top. Just delicious. Now that the weather is changing and Rome is down to a balmy 25C midday, soup seemed the right choice. I really fancied some autumn food, and though the market still has peaches and melons, there is more pumpkin appearing, along with some lovely funghi porcini. 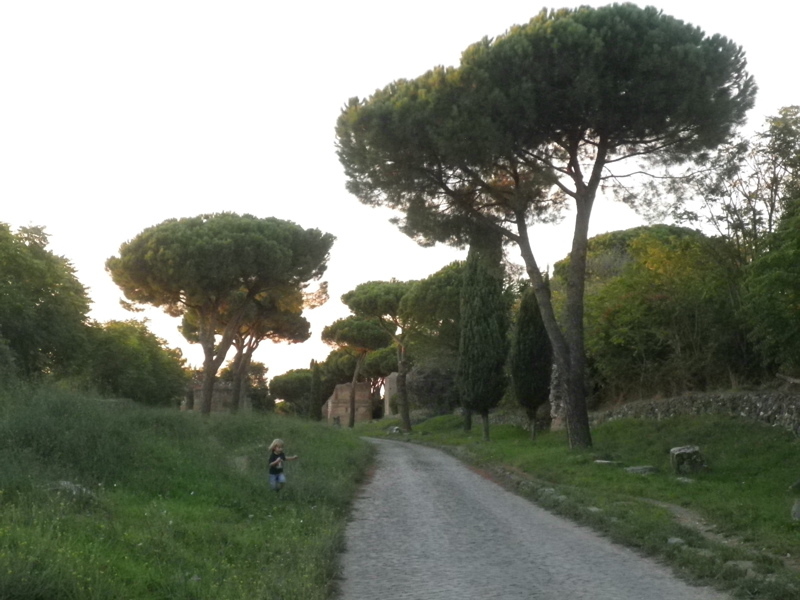 We had the porcini roasted with zucchini, onions and eggplant last weekend after our Appia Antica walk last weekend, just delicious. I had seen Roasted Garlic & Cauliflower Soup at Spirited Explorer recently, and thought that looked like it might be fun to try. I omitted the mirin and thyme from that recipe, added more roast garlic and served the final soup with a splash of balsamic vinegar. Very tasty, and garlicky enough to scare off the remaining mosquitos. Following procedure from Spirited Explorer: Heat the oven to 180C. 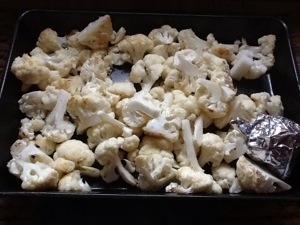 Place chopped cauliflower in baking dish and drizzle with 1 tbs of olive oil, toss. 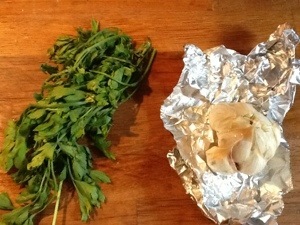 Cut off top of garlic head, rub it with oil, wrap in foil. 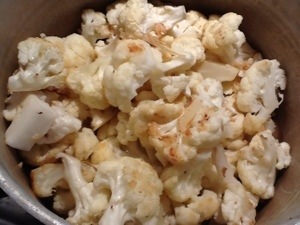 Roast both for 45 min or so, or until soft, tossing cauliflower occasionally. You’ll see the cauliflower develop some nice golden spots. 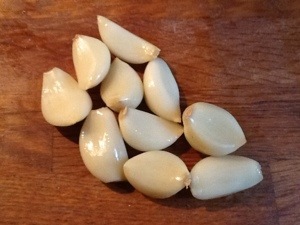 When done, the garlic cloves will be easy to squeeze out. In a pot, sauté onion in 1 tbs olive oil for a few minutes. 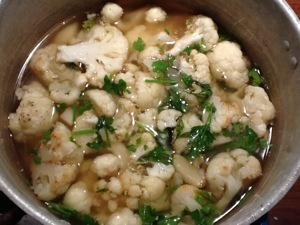 Add garlic, cauliflower, salt and stock. Add salt, pepper and coarsely chopped parsley. Boil for 5-10 minutes, and blend with a hand blender. It’s relatively thick, despite not having flour added. Taste, add more seasoning if needed. If you like balsamic vinegar, add a small splash in each bowl when serving. 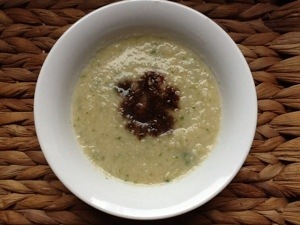 Notes: I was not sure about how the balsamic vinegar would work, but it was nice, it gave the soup a different edge. 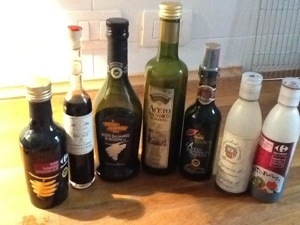 A couple of friends left Rome and gave me their kitchen remnants (much appreciated), which included balsamic vinegar. So now we have a multitude of open balsamic vinegar variations, and need to find ways to use them. Any suggestions? 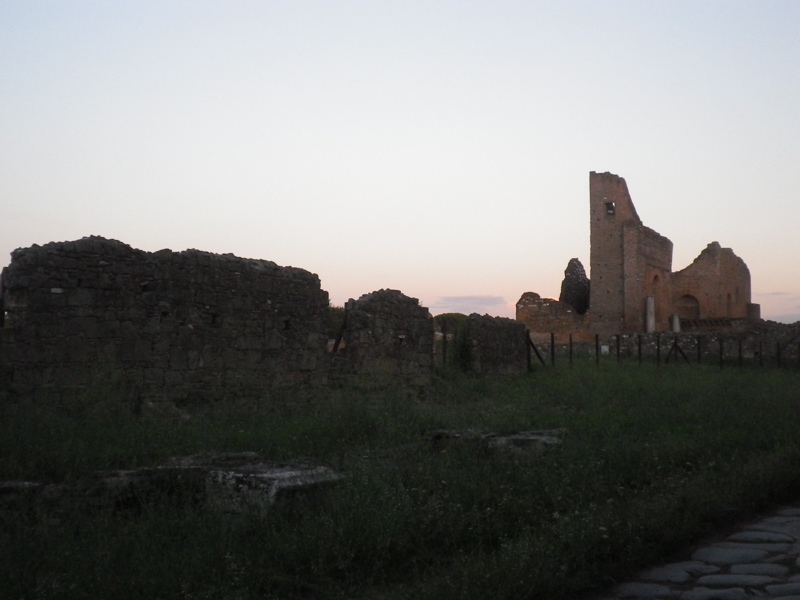 This entry was posted in food and tagged cauliflower, soup, vegetarian on September 28, 2013 by krumkaker. What to make for dessert? A friend was on her way for dinner, and I had vaguely planned on a quick cake with plums, or a plum clafoutis (a flognarde!) – but had no eggs in the house. That hardly ever happens, but it has been such a busy week, and I am knackered and behind on so many things. Still, where there is desire for dessert, there is always a way. 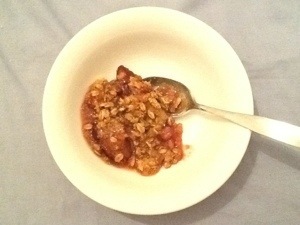 Nothing too heavy or sweet, as this friend is careful about calories, but I thought a scaled-down crumble-inspired baked plum dessert might work. Nothing like an impromptu dessert concoction to lift one’s spirits as well, it is so satisfying to assemble bits and pieces and have something quite nice to enjoy. Low-fat plain yoghurt on the side was nice and tart. 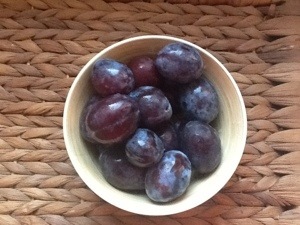 Are these Italian plums not gorgeous? 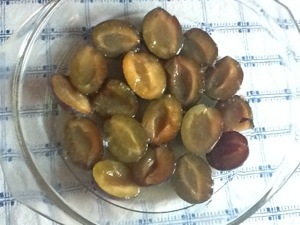 “Italian plums….” I thought, initially reaching for flour. Maybe polenta in the jar next to the flour would work as well? 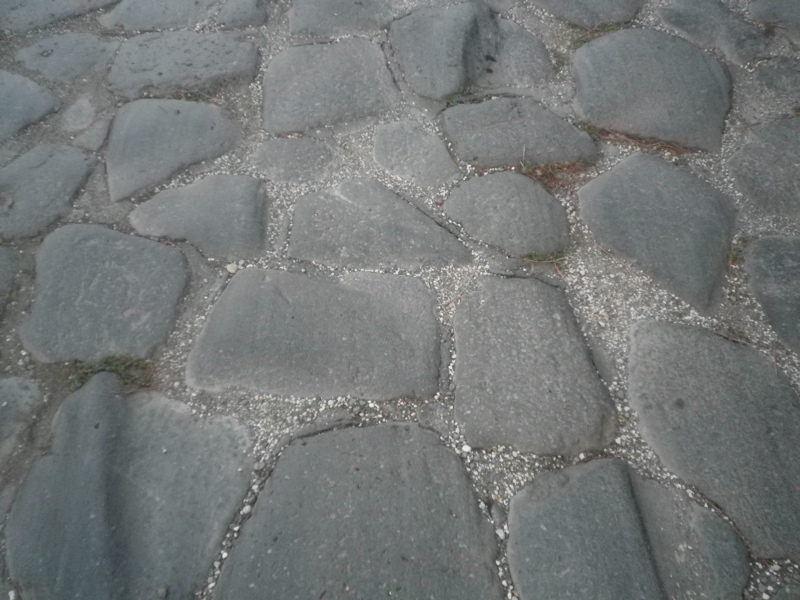 To continue the Italian theme; just a little, for crunch? So polenta went in, not the flour. 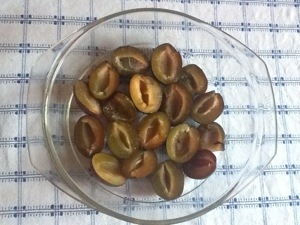 Wash plums, halve and stone them. Layer the plum halved with cut side up in the base of a baking dish. 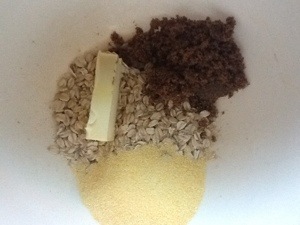 Mix ingredients for topping, sprinkle over the plum halves. Bake at 200C for 25 minutes or so. Serve hot, with a little yoghurt or such on the side if you like. 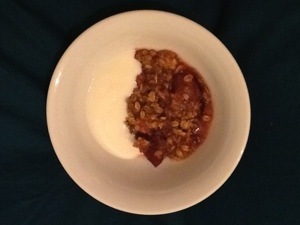 Halved plums with a couple spoons of grape coulis (yes, the runny grape jam from earlier this summer. The jam was just for a bit of moisture and to avoid using more sugar. 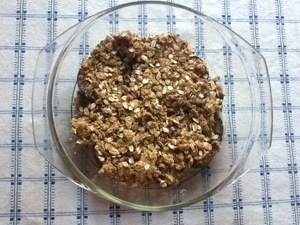 Topping spread on, and voila – dessert! And after dessert, life is always just a little bit better, don’t you think? This entry was posted in baking, food, fruit and tagged dessert, oatmeal, plums, polenta on September 26, 2013 by krumkaker. 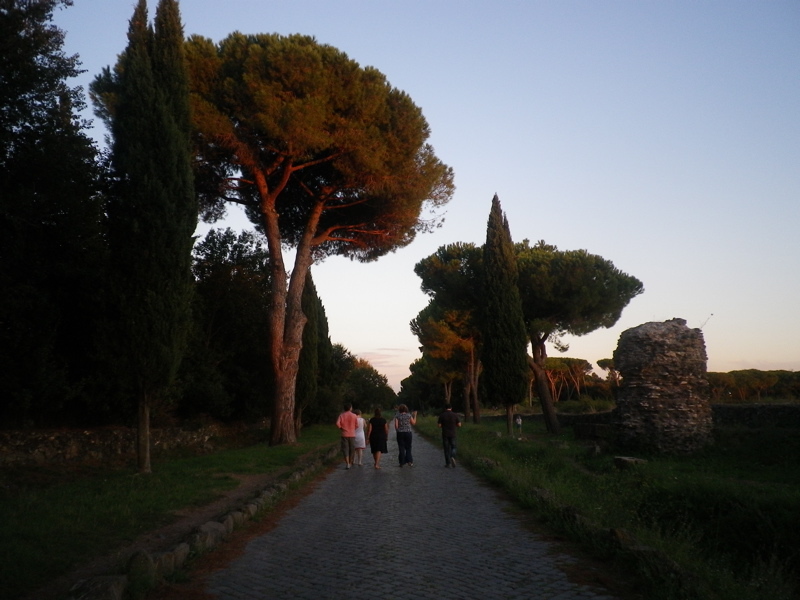 Yesterday, after a long, lazy Saturday lunch, enjoying a glorious September day in the garden of friends, someone suggested an sunset walk on the Appia Antica. 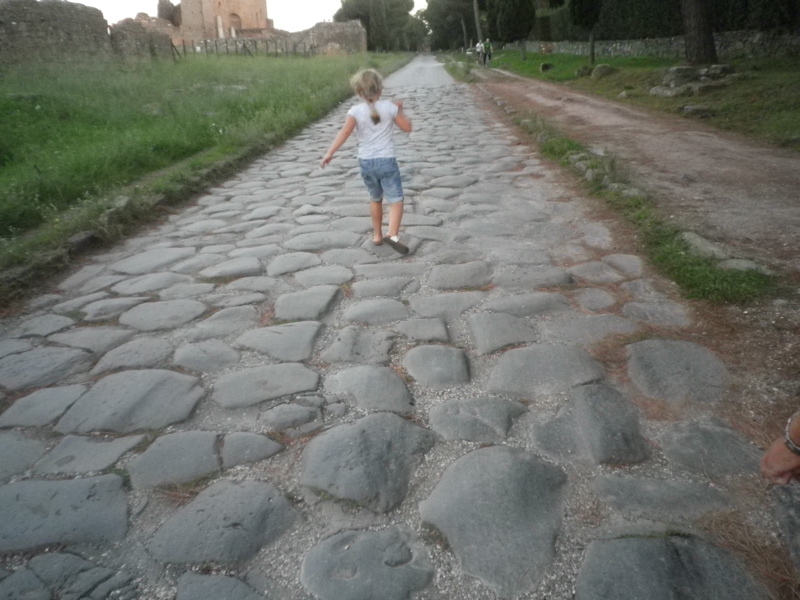 So off we went, some participants with more energy than others. Lovely light. 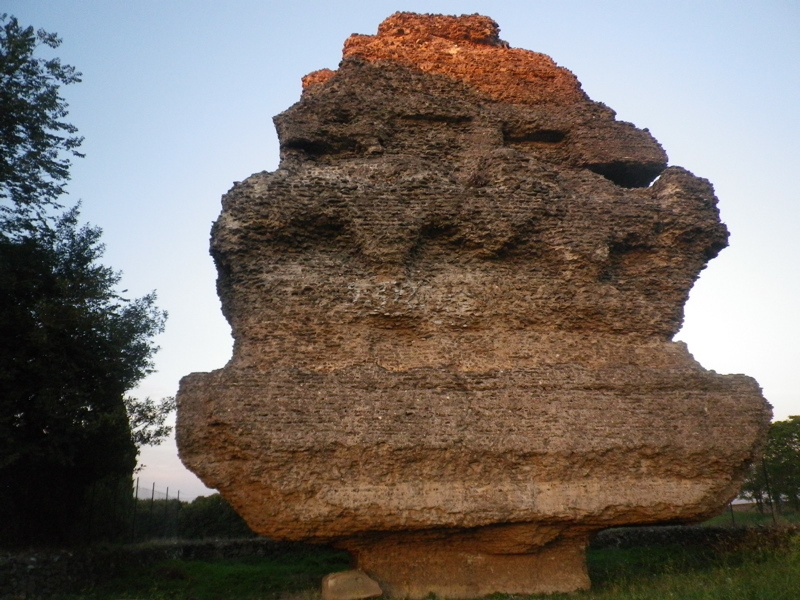 Pyramid shaped tomb ruins. Lots of space to run! It is so nice to still have an impromptu experience like this, and good friends to share it with! 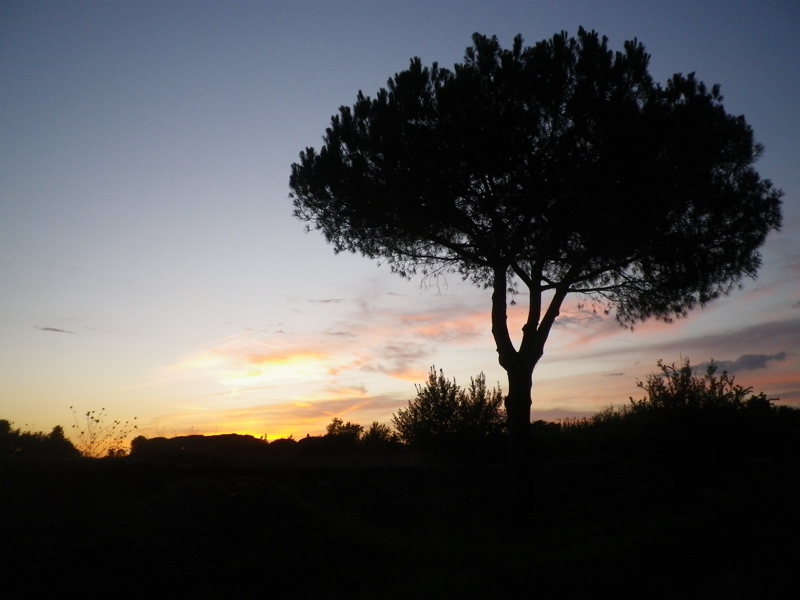 This entry was posted in Italy, Rome, travel and tagged sunset on September 22, 2013 by krumkaker.